Over the past few years, I have amassed a number of posts here about growing from seed that should be helpful to beginner seed starters. While these seed starting tips are aimed at beginners hopefully, they will be of use and interest to more experienced gardeners who may not have done much seed starting in the past. These tips on seed starting cover what items you can repurpose in your home to make seed starting pots, seed germination, and the types of seed staring mixes you can use. If you find that there’s a seed starting question that has not been answered you can leave a comment below or try my seed snatcher search engine which is exclusively devoted to information on seed starting and seed saving. The first thing I do in preparation for starting seeds is to take inventory of my seeds. 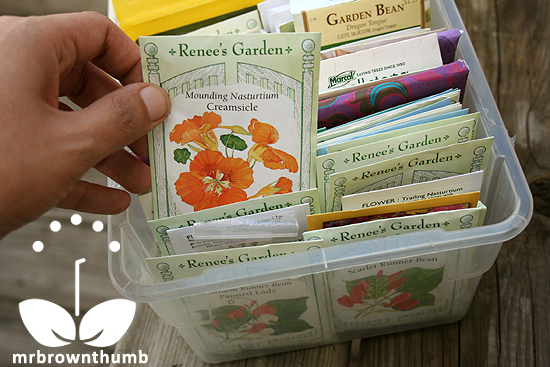 Make a seed organizer so you know what you have on hand and do not buy seeds you do not need. Once you are organized, test your older seeds for germination rates. Last year I tried Jiffy-Mix from Ferry Morse and it worked fine. I cut it with coco coir, which is what I mainly use as a seed starting mix. You can find coco coir bricks at most garden centers now, but the cheapest source for the bricks is you local pet shop where coir is sold as reptile bedding. This year I'll be experimenting with Organic Mechanics' new line of seed starting soil. Repurpose disposable containers like yogurt cups, clamshells for fruit and pastries, and you can even start seeds in plastic soda bottles. If you want to save on seed starting soil and pots, you can sprout seeds in plastic sandwich bags and transfer the seedlings into pots after they have germinated. Toilet paper rolls, newspaper pots (square newspaper pots can also be made) eggshells and egg cartons work well as seed starting pots. 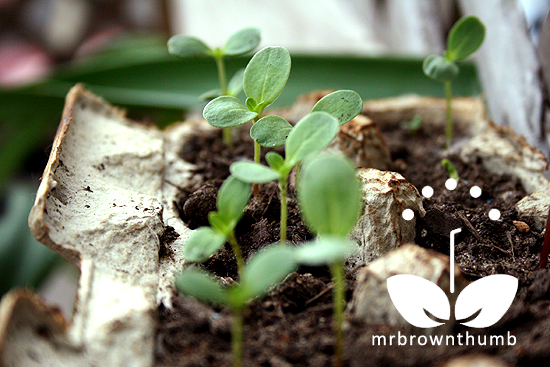 Because egg cartons are so shallow, use them for seeds you will transplant quickly after the seeds sprout. Then there are the commercially available biodegradable seed starting pots available at garden centers, and compostable seed starting trays available from your local garden center. Do You Need Seed Starting Lights? I do not believe you need seed starting lights, a windowsill works pretty well, but there are inexpensive options for indoor seed starting under lights. 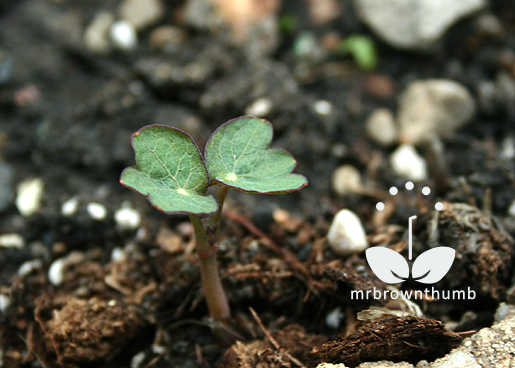 You will not remember which seedling are which after a couple of weeks. Make your own seedling labels and markers from empty milk gallons and other plastic you are going to throw away. Save yourself the trouble of handwriting out many seed labels if you are planting several varieties of one plant. 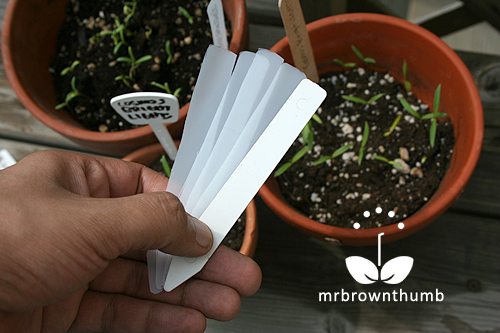 Use colored Popsicle sticks for seedling labels if you are planting a lot of seedling that look the same. Different seeds will germinate at different temperature, but 65F to 75F is best for most plants. Once your seeds have germinated ten degrees less is a good temperature range for growing them on until you are ready to harden them off and transplant outdoors. Depending on the types of seeds you're planting the seeds may require stratification, scarification or they may benefit from some soaking prior to planting. If the seed packet doesn't have recommendation on whether the seed needs scarification or stratification you can usually assume that large, hard seeds will benefit from being scarified and soaked overnight. Keep your seeds moist once germination has started. When a seed dried out it can kill the embryo. Seeds need as much as 50% of their weight to germinate. To achieve this you need to make sure the soil is moist and the seed is in contact with the moist soil. As the soil, dries out it can wick out water from your seed and dry it out resulting in the embryo's death. Take off seed starting domes after the seeds have germinated. You may have noticed that using a regular watering can will splash a lot of water around that displaces your seeds and seedlings. 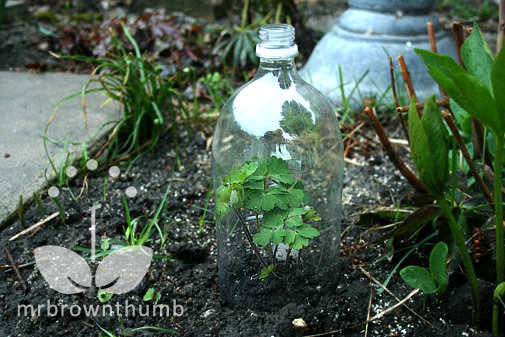 Make yourself a little watering can out of a plastic water bottle that provides a gentle stream of water to keep seeds and seedlings in place. Start your seeds 4 to 12 weeks before your last spring frost. Outdoors you can start seeds after all dangers of frost have passed. The depth you plant your seeds at is very important. One rule I like to follow is to plant at 1.5 times the size of the seed. If I am direct seeds sowing and there will not be rain for a few days I will plant the seeds 2-2.5 time the size of the seed. For smaller seeds, I like to just barely cover them with a fine layer of seed starting mix, sand or vermiculite. Tiny seeds can be quite the hassle to sow. Mix your small seeds in a container like a matchbox or a mint tin with sand or finely sifted compost to evenly space the seeds when sowing. Sowing seeds directly into the ground or containers will save you a lot of time and trouble. 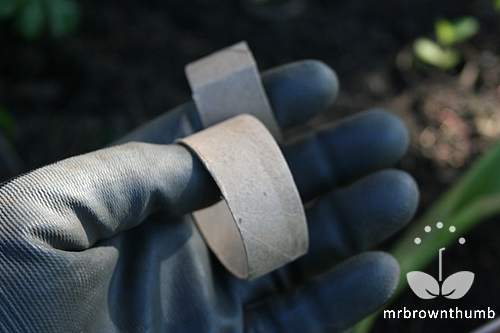 If you are unfamiliar with what your seedlings will look like make some collars for your seedlings out of paper tubes. When you are digging or weeding around in your garden you will know the plants growing in the paper tube collar are seedlings and not weeds. 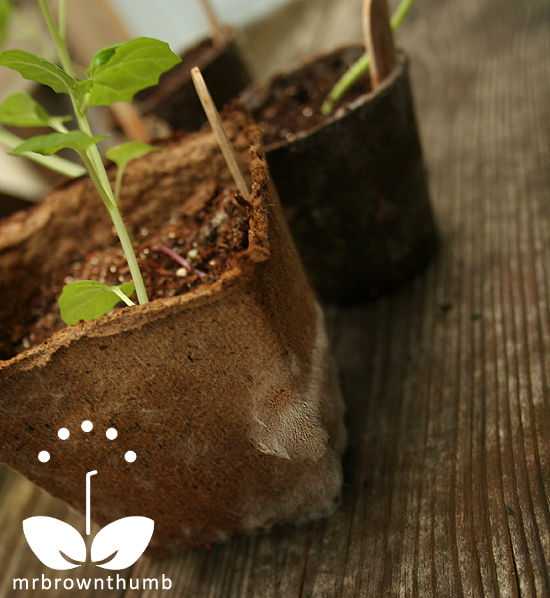 When starting seeds in biodegradable materials like newspaper pots, paper tubes and peat and coir pots you may encounter a fuzzy white growth on the pots or the soil. The fuzzy white stuff growing on your pots is called mycelium, and it is pretty much harmless. It occurs and spreads when the soil and biodegradable pots are too wet and the pots too close together and there's not enough air circulation. To prevent the white fuzzy growth from occurring make sure you're not over watering and there's plenty of air circulation. Open nearby windows or install a small fan to move air. If the fungus has grown and spread you can try some home remedies like sprinkling cinnamon or watering with chamomile tea to kill it. Early spring temperatures can fluctuate widely and put your recently planted seedlings and transplants at risk when the temperatures dip at night. To protect your seedlings from frost and cold temperatures you can cover them with homemade cloches. It is easy to jump the gun and want to start seeds the moment spring officially arrives on the calendar. Unless you can provide seedlings with the proper light requirements, temperature and moisture wait until the weather warms up enough. I know it is hard, but resist starting seeds too early to ensure you start your garden with healthy plants. 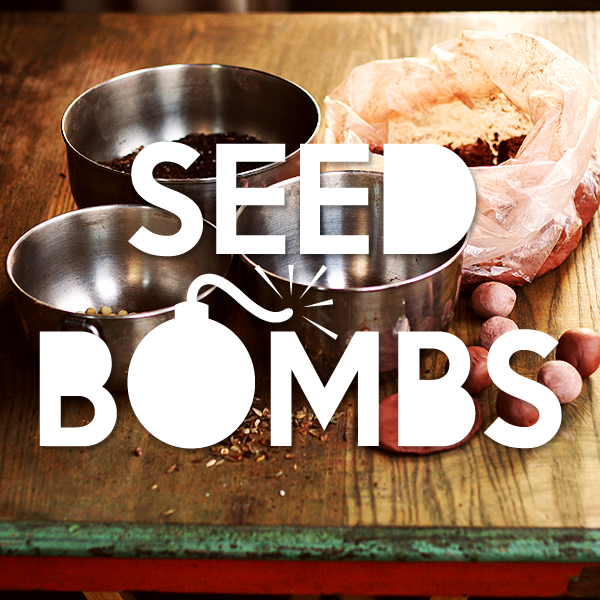 Seed bombs are a great tool for guerrilla gardening. They can also be used to get kids and groups involved in planting seeds in a way that is more interactive and educational than just seed sowing. Seed bombs allow for creativity and fun in the garden. See How to Make Seed Bombs for directions with pictures and video. If you have questions about starting seeds that are not covered in these tips for beginners you can leave a comment below. Hopefully this collection of posts on how I start seeds and answers to some of the frequent questions I receive on seed starting will cover all of your questions. Answers to questions or problems on seed starting can also be found in the seed snatcher search engine. Give it a try and let me know what you think. I'll add to this post but you can also refer to the tab on seed saving for more posts on seed starting and saving. Thanks for tips, Mr. BT!!! I have another question for you. I admit I have never had the patience to wait to dry seeds taken from fruits and vegetables, and now in the wake of NO JOB, and trying to be frugal, I want to save seeds and get them started. I just took some from a poblano pepper (one of my new loves)...I have the seeds drying on a paper towel in windowsill. How long do they need to dry for before I can plant them??? That is my question. I had sowed some red pepper seeds after letting them dry a week, and got nothing!!! trying to figure how to leave questions or comments, i am trying to grow morning glory. i put the lil black seeds in water an few swell up, the rest no, i put dirt, a=in lil plastic or foam cups, and a lil water, do i add water everday or let it be, i live in mexico the weather is not cold, so my cups are outside, am i doing this right??? You don't have to dry the seeds to plant them. As soon as you have the seeds you can sow them in some soil. If you're drying seeds for storage I like to let them air dry for about two weeks. Make sure you flip the seeds over to allow for the both sides to dry. 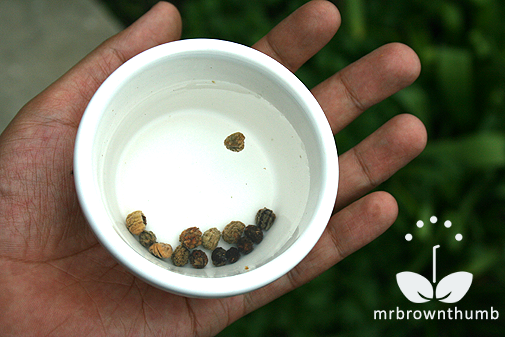 Anonymous, If you are soaking morning glory seeds you don't need to keep adding water to the existing water. If you are planting them in soil just keep the soil moist enough so that it doesn't dry out. If that means watering every day because it's hot outside, then you'll have to water every day. Thank you Mr. BT! I'm a little more experienced than a newbie, but not as knowledgeable as a novice. I love your tips! I even tried some of them on my own, without realizing I was doing something good for my plants! I use egg crates (plastic & cardboard), pudding cups, orange juice containers, water bottles, and seltzer bottles. The seeds I started in the water bottles & seltzer bottles (putting soil in the bottom & putting the top back on - I called it "terrium (sp?) style") seems to be working the best. I will be signing up for your RSS feed. I love learning all this new gardening tips! 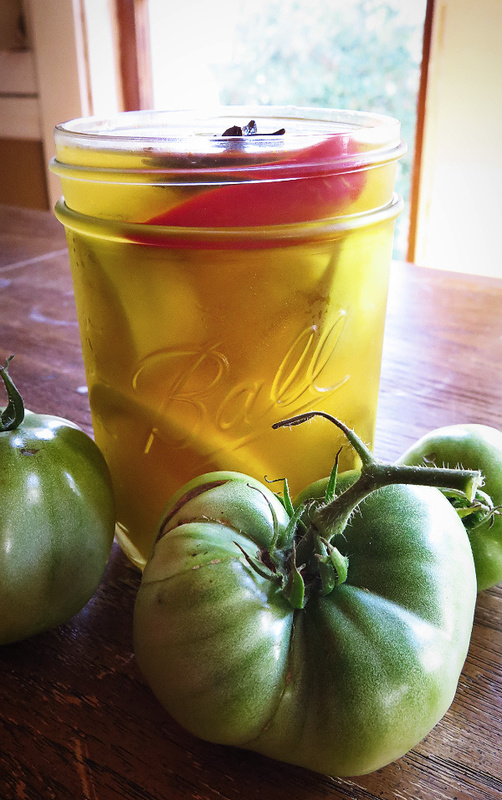 PS: I've also started canning. This year will be my 3rd year. I'm getting better at making less mess and more canned food! Great tips as usual. I use the 2 litter bottles to cover plants too but sometimes our wind blows them away. I have resorted to putting full water jugs on each side of them at times. I found that milk crates are great holders for the homemade biodomes made from plastics like soda bottles and plastic milk jugs. Great ideas MBT. I am not crazy about the seed starting soil I bought this year, different than last year. Plants are off to a slow start. I like the idea about the watering bottle so the plants are not flooded. I know what you mean. Sometimes the premixed seed starting soils can be hit or miss on account of how they're mass produced. I can't really give you advice as I don't know what Zone you're in or just how much shade your spot gets. But I would recommend going to a garden center or nursery (not a big box place) and speaking to someone there in the perennials department. Resist the urge to plant flowering plants and learn to love foliage plants because they're the ones that will do best in shade. There are also a bunch of books on the topic of shade gardening that you could check your local library for. I wish I would of read your post before I started a few of my plants. Well, I guess it was my learning curve. Seed starting is easy once you learn some of the tricks. The best part about seed starting is that you're dealing with seeds which are less expensive than full grown plants so there's room for error. I'll have to check out your blog. The Cloche idea is a good one! I may be brave and plant out a few winter sown seedlings. With a cloche of course! Those were lovely tips. I haven't so far put in much efforts in sowing seeds. But I love to experiment. In the sense, I just sow seeds from fruits that we eat. At times, they do germinate but whither away. I had sown lemon seeds a while ago and yipeee a few have sprouted. Do I need to transplant them?> If so, after what period. Presently the shoots are about 2-3 inches. They sound like they're still kind of young, so I would leave them in there and let them continue growing. Although, I should explain that the seeds from fruits will almost never produce fruit like the one you ate them from because commercial fruits are hybrids and their offspring will be hit or miss. But it's fund to experiment with them and grow them just for show. And who knows maybe the fruit will taste alright. Off topic here: I need to know how to recycle my metal coffee cans into planterns. My concern is rust, what will it do to soil or plants? Do I need to paint them, if so with what type of paint for the inside of cans? If you only use the cans for a season or two the issue of rust won't be much of a factor if you're worried about edibles. I would not recommend painting or coating the cans with anything because whatever you do paint them with is probably worse for you than the rust. Hi Julie - You mention drying out the seeds. I've have a gardening friend who recently SOAKED her seeds for 48 hours, and little taproots came out the bottom. She then planted, roots pointing down, and had great success! Another gardener I know is soaking his for 8 hours. It may depend on the seed, but I think moist = good. Oh...thanks so much for this info, Mr. GT!!!!! I couldn't seem to find this answer anywhere!!!! I am so glad to have just found this blog. I'm signing up now to get updates; thank you so much for the wonderful information! Thanks for the feedback, Jaime. The plants I seeded out doors - spinach, chard, peas, broccoli rabe, lettuce, radishes, carrots - seem to be doing ok - but not amazing. Next year I'll follow your tips! Thanks so much! Crelatia, Hope you have better luck in the garden starting seeds next year. Wow thank you for these awesome tips!! I just bought my seeds today & am looking forward to beginning my first ever veggie & herb garden! I found your blog through google (although I now forget what I was looking up) & have spent literally the last hour or 2 reading through it. When I realized I was pinning every post I read I told my husband, "I have to follow this blog!" Thanks again! Thanks for the feeback. Hope the posts came in handy with your garden this year. 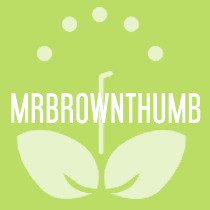 Mr Brown Thumb! Amazing ideas, sir. Wow! 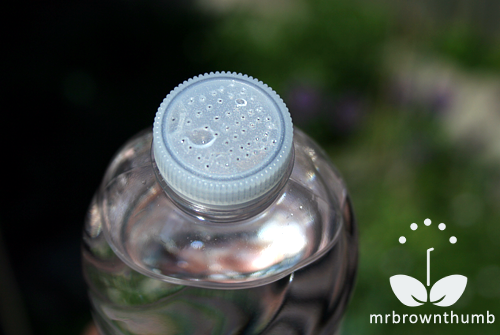 Poking tiny holes in a bottle cap?!! That is remarkable! I used to live in Southeast Logan Square. It took moving to Missouri for me to learn about you. Thank you for keeping up this wonderful website. Ha, That's funny. A couple of people who lived here and have moved away have mentioned the same thing. Glad you found it anyway, and I hope you find the garden blog here useful from time to time. I found your blog today and I am absolutely loving it! Thank you so much! The watering can idea out of a bottle, that is awesome, I will definitely be doing that this year! I have a question if you have time. I have tried to grow my own seeds for the past several years. NO LUCK! Either they dampen off and die, or they die after I transplant to a slightly bigger container, or they simply just don't grow much after they sprout. I figured out some things I was doing wrong, and chamomile tea solution really helped, but my problem last spring was the seeds germinate and grow great, and then they completely stall and eventually die. I was watering from the bottom, and using a spray bottle to moisten the soil on top, (we heat with a wood stove, so soil dries out very quickly here) I even put up a fan to help circulate the air. I used grow lights, seed starting mix and added pearlite and peat moss, And I even waited until the recommended time for starting indoors before the last frost according to the seeds packet. (which about killed me waiting btw lol) I spend all the work and time growing seeds, and then end up having to buy from our local greenhouse anyways. The very few that have made it to the garden and survived,(i grow mainly veges and herbs) produced so late, the frost ends up getting them before I hardly get anything! I love plants, my husband teases me and says our house is a greenhouse because of all my houseplants, but for some reason I can't grow from seeds?! Even if you just can recommend me to another link or past article you wrote with detailed instructions on seed starting and transplanting so that maybe I can see what I am doing wrong? Thank you for your time, and I love your blog! I know it can be frustrating trying to grow your plants from seeds if you don't have immediate success, but keeping it and learning from the mistakes as you've done is the way to get better at it. I'm not sure what kind of seed starting mix you are using, but the seeds germinating fine and then stalling sounds like it could be a fertilizer problem. Does your seed starting mix have any fertilizer in it? The first few weeks after the seeds have germinated, they don't really need any fertilizer because they feed off the reserves in the seed, but after that they will benefit from a regular application of a diluted fertilizer to develop strong roots. I'm not sure what zone you are in, but I would recommend trying your hand at direct seed sowing (see the link above)in the garden in addition to trying to start some indoors. When the ground warms up (contact your local Master Gardener Extension for tips on when this happens in your area) sow some seeds directly in the ground. If your indoor seeds don't do so hot, you still have the backups in the ground. The other thing I can think of is that your indoor setup may be too hot and too dry. I'm imagining heating with a wood-burning stove results in temps that fluctuate wildly, and coupled with the fan going, your seeds and seedlings are drying out waaaay too fast, or staying wet too long. As for transplanting to larger containers, how long are you waiting to transplant to a larger pot? 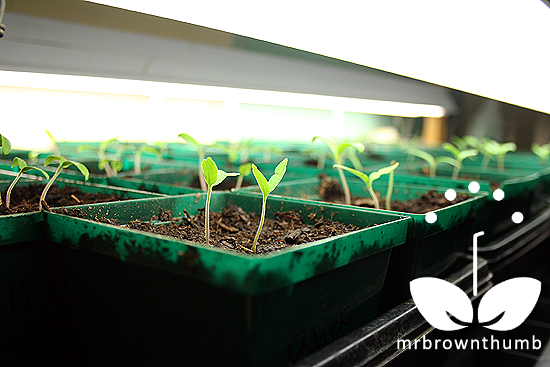 If you don't have a lot of experience with transplanting seedlings, it could be that you're transplanting too early. Make sure the pot is almost filled with roots before transplanting. There will be some breakage of roots when you transplant, so make sure that when roots break there are still plenty of roots to take their place. I also don't know how big the seed starting pots you are using are, so I'm going to recommend starting your seeds in pots that are the size of yogurt containers or a little larger. They may be large enough, depending on the type of plant you're growing, that they won't need transplanting until it is time to plant them in the garden. Alternately, if you start seeds using biodegradable seed starting pots you can (provided they are large enough) not bother with transplanting with larger pots and go directly into the garden with them. All of the posts here about seed starting and seed saving are located under the "Seed Saving" tab. Check out the one that seem like they would be helpful to you. it, you might be a great author.I will be sure to bookmark your blog and may come back down the road. Thanks for all the great advice! We also made tiny holes in a plastic cup for watering the seed containers, similar to your plastic bottle idea. I have to wait patiently for the tiny drops to fall, but I'd rather not damage the plants. I've just planted my first flower and pepper seeds this year and have already seen a lot of them die off. With the weather getting warmer, I hope to have more luck. I will subscribe to your blog and look forward to more useful tips. Hi there! This is my first year making a real garden (aside of just throwing seeds out and seeing what happens). I used the jiffy seed starter as well as the little peat pots. So far I sowed some cherry tomatoes, green peppers, and mung beans. they have all sprouted and seemed happy until today I noticed a few looked a little tired I guess. So I picked one of the pots up to check out of instinct and I found teeny teeny tiny white bugs that almost look like worms as well as little bubble looking things, maybe eggs? they are almost invisible and are all over every peat pot. What are they? Are they a threat? I'm worried. I separated them and made room and air between the pots, what else can I do?